An outtake image from the groundbreaking series “Young Idea” by Marit Allen for British Vogue shot by Duffy in 1964. The outfit is described as “Checkerboard Tweed to blind the eye” and was available from Tuffin & Foale for 16 Guineas. 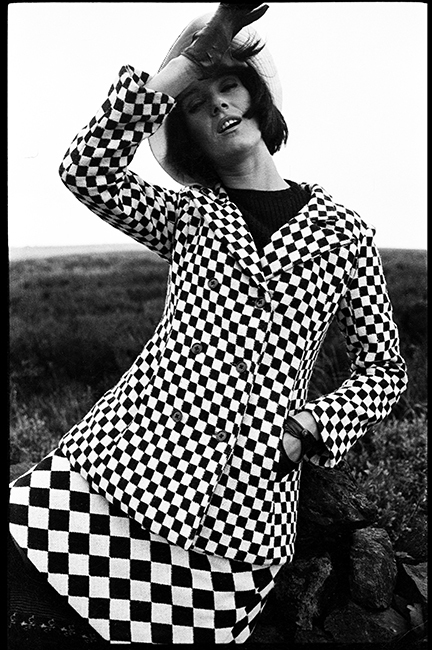 Marion Foale and Sally Tuffin were a key label of the swinging sixties originally selling clothing such as this out of Woollands 21 before opening their own store in Carnaby Street. This outfit was on display in the V&A along with Duffy’s images for the “Balenciaga: Shaping Fashion” exhibit between the 27th May 2017 – 18th February 2018. Quote ref: Z_0378_03 if you require press information regarding this image.